Recently, members of the Rutgers University Libraries at both integrated Information Systems and the Scholarly Communication Center began an auspicious collaboration with the Asia Society in New York City, in our first project to digitally preserve, to standards, their digital video archive for The China Boom Project. It is the first time that RUcore has ingested a fully born-digital video archive, using the original source content and project files, and creating presentation video from those source files. 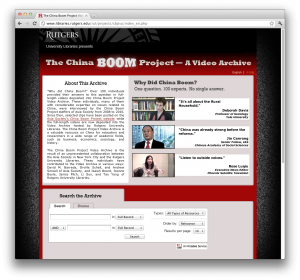 But while the China Boom site itself provides snippets and prepackaged commentary, an ancillary goal of the project has been to partner with educational institutions to make the full-length content available to researchers, and to have the video archived and preserved. This is where Rutgers University Libraries, and RUcore, come into the picture.